Following low carb and missing hash browns with your meals? Guess what? I have the SOLUTION!! These low carb hash browns will make you smile and forget all about those potato hash browns! I’ve been crazy busy with work lately and haven’t had the time to have a coffee with you guys!! It’s sad isn’t it? We need to make more time to enjoy the special things in life that make us feel good. For me, it’s things like flowers and the forest, coffee talk with friends, and carbs. Yes.. carbs. I HEART CARBS!!! Bread, potatoes, pasta, cakes, cookies, rice, anything that makes you feel all fuzzy wuzzy comfy in your tummy. So let’s talk a quick second about HASH BROWNS. Ohhhhhhhhhhh yes. Crispy , starchy, yummy, hash browns…… With bacon…… And sour cream. Let me tell you, I look at a dish of yummy hash browns and it’s like have those cartoonish googly hearts in my eyes if you looked at me, looking at them. As heavenly as it would be to eat like this consistently, sometimes substitutions must be made. Fear not my lovies, I have found the perfect replacement for those high carbed potato hash browns!! Ready? What is the secret to these amazing keto diet hash browns??? 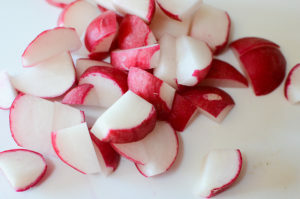 RADISHES!!!!!!! Haha!! Yess!!! Radishes!! Ok, wait wait wait!! I thought it was crazy too, but I just had to try it out…… and it turned out PERFECT. They don’t taste exactly identical to hash browns, but come on,.. they’re not potatoes either! But honestly, I think people be hard pressed to identifiy that they are a radish and not a potato. But seriously, if you love hash browns, this is THE DISH that comes closest to replacing the potato variety for a low carb or keto side dish. Plus, they’re so easy to make! Check it out!! 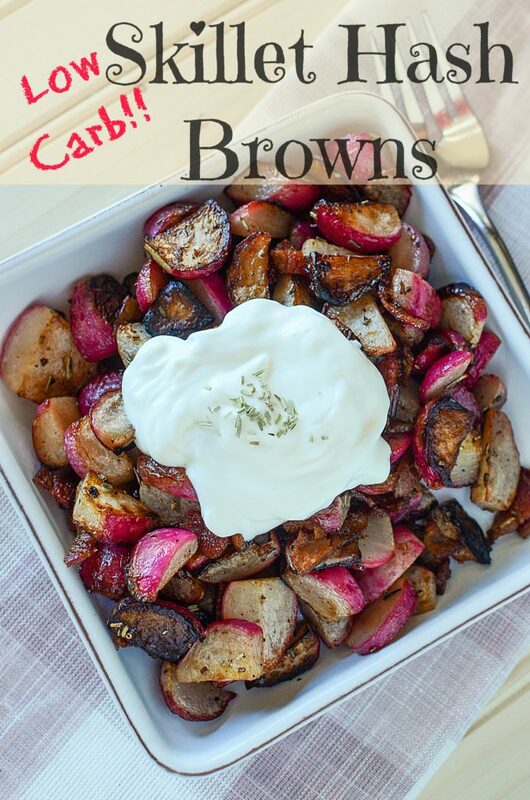 But will these low carb hash browns have that peppery bite that radishes do?? Are you worried they have that peppery bite? THEY DON’T! I’m not sure what magic happens during the cooking process, but when they’re fried, the peppery bite disappears. Awesome, right?! 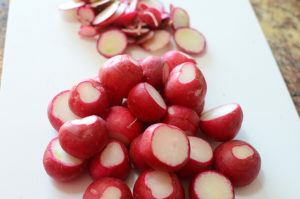 Ok, so we want to start off with about 1 pound of regular red radishes. Cut the both ends off (the long root end, and the end the greenery was attached to ). Then slice them in quarters, give them a sprinkle of salt, (or any other seasoning that you like), and we’re ready to go! Saute one-quarter of an onion and about 3 chopped strips of bacon in a teaspoon of butter. (The onions and bacon are optional of course, but I really recommend you include them at the party. They really make a difference to the final dish). When they’re translucent and the bacon is crispy, remove and set aside. Crank the heat up on the pan (I used a cast iron pan, but you can use any pan that you prefer. Just be sure that it can withstand some decent heat.). When the pan is hot, add a tablespoon or so of oil if you didn’t use the bacon, and throw in your radishes. Try to fry them cut sides down so that their little pink sides are all upright. Leave them to caramelize in the pan. You want a deep caramelization here….. not burnt, but really nice, brown and crispy. So move the low carb hash browns around on the pan when they start to gain their color and brown all the cut sides. When you reach the desired amount of crispiness/caramelization, turn the heat down, add the onions and bacon back to the radishes. Let them all mingle and be friends for a bit, and then simply dish them out! 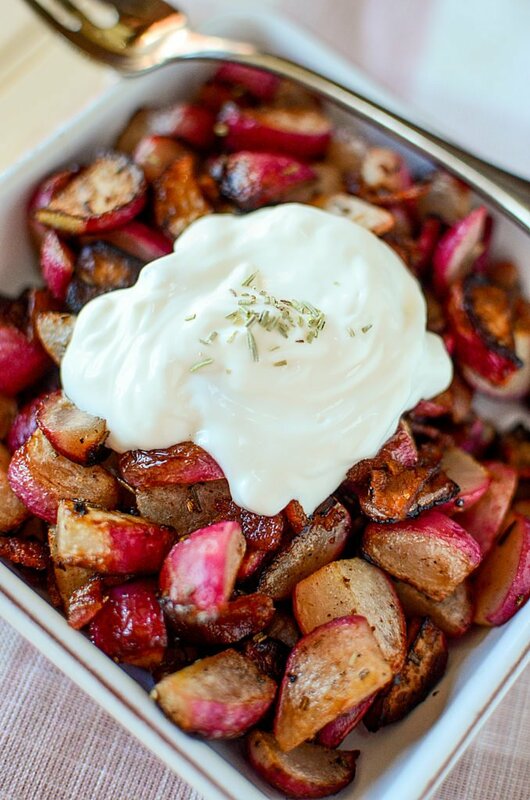 Garnish with a dollop (or two) of sour cream and you’re in carb-less hash brown heaven! I was seriously shocked at how good these were. It’s definitely something I’ll keep in my low carb handbook. 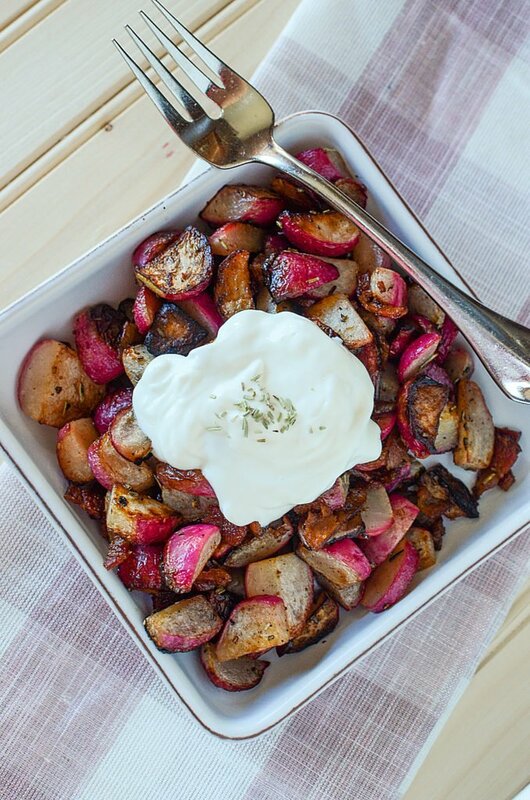 I think the next time I want to make these low carb hash browns, I’ll try the diakon radish (long white ones), and see how they turn out. Let me know what you think of them, I’d love to hear from you! These low carb hashbrowns will make you forget about the old skillet potato hash browns. 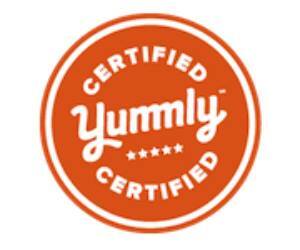 When doing a keto diet or a low carb diet, it's all about taste and finding substitutes. Well your keto skillet hashbrowns are here! « 5 reasons you need to come back to butter!